I’m starting a series of article on how to build your own guitar kit the right way. This particular project features an SG guitar package. Each post is going to feature a video detailing every step needed to achieve an astonishing looking guitar and listing all the tools required to perform the task ideally. The SG kit I am going to setup is not recommended for a starter kit. The reason is the set-in neck. Set necks are not that difficult to install, but if you fail, it’s tough to correct yourself. The idea to make your guitar using kits is to avoid the cost of a luthier. Having to pay one at the first step of your first kit is not wise. That’s why I advise you to start with a bolt-on neck type and to go to a more advanced plan after having gained some experience on easier models. If you are used to woodwork, you can start right away with a set-in neck model and be assured to complete this guitar easily. Building a kit is not only cheap but, it’s also the best way to construct a unique guitar and make it better than an instrument from an established brand. If you have ever checked inside a guitar, you know what I’m talking about. An electric guitar, especially a solid body type, is quite comfortably achievable and require limited knowledge in electronic and woodworking. You can build your own Gibson or Fender or whatever kind of guitar you might dream of if you know how to use a screwdriver, and if you are willing to take an hour to learn how to solder and how to use a spray can properly. You can also amend it with wiring options that none of those guitars have, for a fraction of the price. We are just paying the brand name and 50$ of equipment. I have built all the 18 guitars I’m using, And they didn’t cost me the price of a Les Paul. I bought the kit I’m going to use at Aliexpress. I paid $159 for it, shipping included. It was the cheapest SG kit I could find on Aliexpress at the time. Before buying it, I contacted the seller in PM to ask him to make a real Gibson head shape. Most of the kits own what they call a shovel neck, probably to avoid copyright issues. I think it looks atrocious, and I didn’t feel to modify it myself. I only have a jigsaw and the outcome wouldn’t have been too good. Thankfully he accepted to do the mod free of charge. So, if you are buying your kit on Aliexpress, you can do that. On other sites, I don’t think so. I’m going to glue the set neck and paint the guitar using a dark brown nitrocellulose guitar lacquer from Dartford. Sadly, I had a hard time recording the video while talking and working at the same time. The job I did was good but the videos recorded were unusable. So for this first video, I’m going to use pics that I took at the same time. For the next videos, I’ll shoot without talking and do a voiceover later. The first part of the process is to glue the set-in neck. It is truly an easy job to do, as long as the kit respect the accurate scale of the original model. If it’s the case, it’s just a straightforward task. SG guitars have a short scale, like most Gibson’s instrument. The scale length of an SG is 24 3/4” or 629 mm, from the nut the bridge. 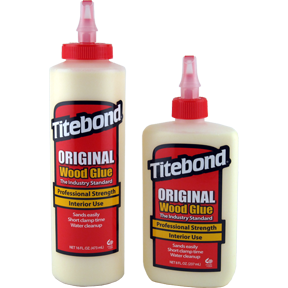 To glue the neck you have to use the right glue. I’m using Tidebond. This brand is widely utilized by luthiers. It is extremely active and dries fast. You also need two or three Screw Presses. The pieces you are going to glue must be extra clean and dry. You only have to apply the glue thoroughly and press as hard as possible. Do not forget to protect the guitar and to place something in between the guitar body and the screw press jaws. Otherwise; it’s going to leave marks. The secret of successful gluing is to squeeze really hard and to let the time do its work. Patience is the keyword in guitar making. Before painting the guitar, I had to modify the electronic rooting to install the two toggle switches I need for the advanced wiring I plan to make. More about that in coming articles. I installed the wiring harness to find out the better place to install them. It is crucial to avoid wrong placement, not to have the switches located in awkward places or worse, being obliged to relocate them. When I was done with the rooting mods, I protected the fingerboard and the inlays using masking tape. I also gently sanded the entire guitar to have a clean surface. It is imperative not to leave marks in the wood. Otherwise, you’ll have to use wood filler, and using Wood filler would make impossible to spray the translucid paint I bought. You must let the guitar dry an hour or two after having applied the first coat. When the paint is dry enough, pass the palm of your hand on the guitar to feel the imperfections. If the surface is a little rugged, use a thin sand paper (600 grid and above) to make it even. If you do it right, this is going to be the last time you’d have to sand the guitar. I apologize once again for the lack of quality images. It was impossible to unglue the neck just to make a better video. I learned my lesson the hard way. Next video is going to feature live content only. In the next video, I’m going to cover how to make and paste a water transfer logo and how to apply the finishing coat of nitrocellulose satin varnish. I very nearly bought a kit a few years ago but didn’t trust myself to do a good job, are there any kits you’d recommend for a complete beginner? It all depends on your woodwork abilities, but as I explained in my first article, it is better to start with a bolt-on type of kit. Depending on your taste, you can choose between a Stratocaster, a Jaguar or a Telecaster. I stumbled upon your post and decided to read it since my son is in the process of building his own guitar. He has several store bought guitars already, and is anxious to add one he has made to his collection. Much of the details in your post went over my head but it did sound like you knew what you were talking about. I just email your link to my son, so that perhap he will find some helpful information. Thanks for the post. Sounds great. This article is the first of a series. 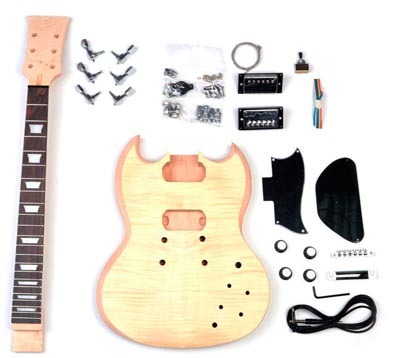 It’s an over the shoulder type of articles where I’m building an SG guitar kit from unboxing the kit to testing the guitar. Stay tuned for the next article in wish I’m going to explain how to make your logo using water transfer paper. Wao.. I always wanted to learn how to play guitar. I didn’t know that there is a possibility to have a guitar kit. Cool! Never thought of building my own guitar. Maybe in the future, I’ll try to have one. It’s much easier than it looks like. You should definitely give it a try.